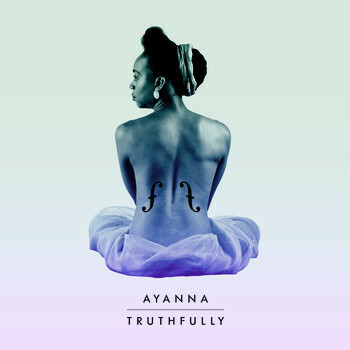 Singer/composer/ace cellist Ayanna’s EP “Truthfully” (AWJ001) is simply sumptuous and gorgeous. It somehow operates in the territory beyond jazz and soul, where beautiful music is just that… beautiful music. "Powerful, poignant, music of great integrity. Highly recommended." Powerful, poignant, music of great integrity. Highly recommended. The liner notes explain that “Truthfully” expresses her “experience as a 21st Century woman, drawing upon the stories of Sojourner Truth, personal relationships, female experiences and hope as inspiration”. However, if you are a bloke reading this, don’t let that put you off, honestly, there’s a lot to take in here and it’s well worth the listening. The five track EP (four written by Ayanna herself) contains her skin-tinglingly idiosyncratic version of “Roxanne” (yes, that one!) reborn as a tango-nuanced, cello-driven, portion of perfection. I’m really feeling this version - it could have been written just for her. "Slow, majestic and full of power"
Ain’t I A Woman - is a paeon to the strength of women told from the point of view of a slave. Slow, majestic and full of power, this track is, for me at least, the spiritual lodestone of the EP. What’s particularly magic is the arrangement - I’ve never heard a single pause used to such shocking yet perfect effect to support a lyric. Very impressive. "elastic bass tones and timbres throbbing and oozing"
Give In To Sin - Simplicity itself on the one hand, but richness in abundance on the other - the rollicking percussive effects, the elastic bass tones and timbres throbbing and oozing, soulful trancelike lyrics endlessly repeated yet sung with the heart on a sleeve: “You composed the hymn that holds us in, but I’m still inclined to give in to sin”. Let Me Go - is a midnight soul-jazz piece - a cry to an ex-lover for understanding and release, as she grows and moves on. The piano (tasty guest spot by Robert Mitchell) is more at the forefront here stabbing and punctuating the lyrics over the plucked cello’s restless bass-lines. "a slice of nu-soul heaven"
Truthfully - the title track is another slice of nu-soul heaven. The nearest I can get to it in overall feel is John Legend, although of course it’s pure Ayanna at heart as she delivers a vocals-and-piano pairing with a lightness of touch that just hits home. "Catch her while you can"
And if all that doesn’t sell it to you then check out my review of her recent concert at Birmingham Town Hall (http://www.worldmusic.co.uk/ayanna) to get the vibe of Ayanna’s live show.